Brandon Workman and I share a special bond. I don’t actually know him, nor have I ever met him or even seen him in person. For me personally, he falls under the category of Athlete-That’s-Probably-Not-That-Great-And-Yet-I-Will-Continue-Ignoring-The-Evidence. I know he is an aggressively average relief pitcher, but for no legitimate reasons whatsoever, I refuse to accept that. Every time I tuned in last year, Workman was pitching well. It’s sort of like how I know Xander Bogaerts is a good player, yet it seemed like every time I watched his at-bats last season, he was softly popping out in foul territory. If you pitch a perfect 8th inning in the clinching game of a World Series – as a rookie – you’ve officially bought my everlasting affection. Them’s the rules. I don’t really know where this is going – I just wanted to prepare you for a slightly unrealistic overview of Workman’s 2017 season. For starters, Workman successfully returned from Tommy John surgery after a year and a half of recovery. Tommy John isn’t quite the career roadblock that it used to be, but being able to return to throwing baseballs 90+ miles per hour after having a tendon surgically grafted onto your elbow to replace the previously torn one seems like an overall win. His first action for the Sox came in May, but after a couple disastrous appearances, was sent to Triple-A for a couple months. He reemerged in August and was excellent for a long stretch of time. In fact, he was one of the team’s best bullpen options until mid-September. From July 15th – the day he was recalled from Pawtucket – to September 15th, he posted a 2.35 ERA over 30.2 innings of relief appearance. He was tagged for only eight earned runs over that stretch. Also worth noting: Workman stranded 92 percent of the runners he inherited during that time. During that same stretch, Addison Reed, de-facto setup man, posted a 4.07 ERA, allowing 11 runs over 24.2 innings. He also “only” stranded 80 percent of the batters he inherited. While that’s still above the 2017 league average (73 percent), as any 5th grader will tell you, 92 is better than 80. During that two month stretch, Workman was also piling up strikeouts. He carried a 25.2 percent strikeout rate over those eight weeks, four percentage points higher than his career average. He also walked batters less, posting a 6.7 percent walk rate, down two percentage points from his career norm (8.2 percent). His velocity was back up, and was getting more swing-and-misses. He was a dominant, albeit lucky, reliever for two months. At the time, I was the conductor, and possibly only passenger, of the Workman For The Setup Role hype train, and while hindsight is 20/20, I regret nothing. First and foremost, fatigue set in. It takes a while to build up arm strength, and after an 18-month absence from major league games, Workman burned out at the worst possible time. After two great months, his final five outings of the year were a disaster. Workman imploded, posting a 9.64 ERA over the final two weeks of the season while on his way to being left off the postseason roster. My guess is that the team made the decision to include Austin Maddox over Workman knowing that the latter didn’t have anything left in the tank. That’s not to say it’s the wrong decision, but I just can’t imagine the team ignoring the first two months of results in favor of the last two weeks as the only factor. Like I briefly mentioned earlier, there were also signs throughout his dominant stretch that Workman was benefiting from a fair bit of luck. Workman posted a much uglier 4.10 FIP over his dominant eight weeks, and anytime ERA’s and FIP’s are that far apart, something’s not right. Workman had a home run problem all year, posting a HR/FB rate of 16.1 percent. The league average for relievers in 2017 was a touch over 12 percent, so clearly Workman struggled to keep the ball in the park. His BABIP from mid-July through mid-September was .250, which is nowhere close to his career average (.305) or league average (.295). His soft contact fell while hard contact against him skyrocketed. Essentially, he got hit harder, and farther, while benefitting significantly from luck. Even if you just look at his two-month stretch of successful results, signs of good fortune jump off the page. This is where I’m most torn. 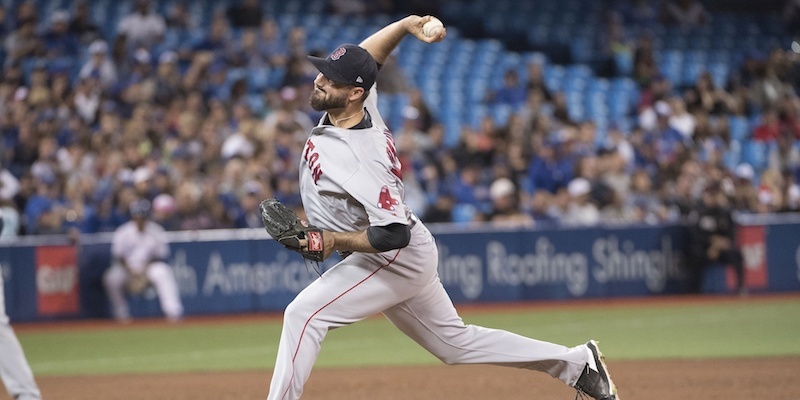 Workman has done a lot for the Red Sox over a relatively short amount of time. He’s shown the ability to be a pitcher that’s reliable in the postseason and equally effective against both righties and lefties. With that said, the team doesn’t seem too keen on relying on him in high-leverage situations – only 16 of his 166 career innings have been spent in such scenarios. There’s also almost certainly regression coming down the pike. With that said, there’s no question that there’s a place for him in this Red Sox bullpen. Personally, I’d love to see Workman get some of Matt Barnes innings, at least early in the season. I still believe there’s a late-inning arm hidden somewhere in Workman, and if worse comes to worst and he’s just okay in that role, it’s fine, because so is Matt Barnes. Assuming Carson Smith takes over for Addison Reed, the 7th inning battle is going to be one of the more interesting Spring Training storylines.